This year was the first year having Thanksgiving dinner in my new home(ish – “ish” because it’s not really where I “live”.. long story). This is also our first Thanksgiving dinner with TURDUCKEN!!! I have to admit, that I wasn’t ambitious enough to make the turducken myself from scratch.. all that bird de-boning, stuffing making, bird tying-up, etc. etc. Some day, though, I will make one of these from scratch. Last year, we were able to make a completely GLUTEN-FREE Thanksgiving. 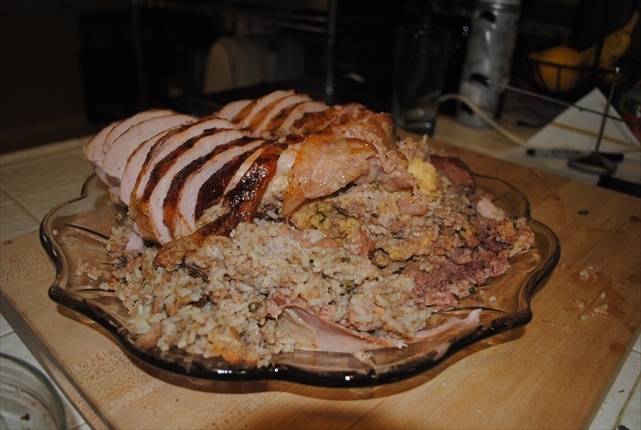 This year, because of the turducken, we weren’t able to succeed in that regard (brown rice and cornbread stuffing were already included with the turducken). But all the sides were kept strictly gluten free. Tur-duck-hen… all sliced up and ready to eat!